Flooding and water damage cause millions of dollars of damage to homes each year. The installation of a sump pump or sewage ejector is one of the most important steps homeowners can take to protect their home, and is relatively inexpensive when compared to the cost of restoring a basement or foundation that’s been ruined by flooding. If you want confidence that your investment is protected from water damage, Master Plumbing & Mechanical can install a sump pump or sewage ejector system in your home. A professionally installed, functioning sump pump can effectively remove excess water through a home’s wastewater pipes or a secondary drain pipe. A sump pump operates by channeling ground and rainwater from around the home’s foundation into a pump well. When the well fills up to a certain level, the pump switches on and directs the water out of a drain pipe and safely away from your home. A professional installation is a must to prevent flood damage in heavy rain, reduce mold and mildew, protect against electrical fires, and ensure the drainage connection is working properly. 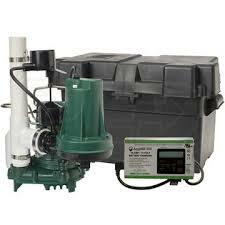 While there are multiple types of sump pumps available, Master Plumbing & Mechanical recommends Zoeller sump pumps. Zoeller has earned the reputation as being the very best solution for any and all waste water issues. Zoeller’s full line of cast iron, durable pumps include a wide variety of submersible low pressure pumps for residential and commercial applications. If a toilet, washing machine, or other plumbing fixture is installed below the main water line, for example in the basement, a sewage ejector pump can be installed to pump waste water, including solids, back up to the main septic line. The sewage ejector pump sits in a sump basin that is dug into the ground and can hold about 30 gallons of waste water. When the waste water reaches a predetermined level, a float triggers the sewage ejector to pump the water up to the septic line and out of the house before automatically shutting off until the next time it’s needed. The sump basin is sealed at the top so that no waste or foul odors can escape during operation of the sewage ejector pump, though a vent up and through the roof is necessary for proper ventilation. Because sewage ejector pumps involve the septic lines, proper permits are required when installing or repairing them. Due to the difficulty level of the job, and the disastrous results that could occur if the installation is done wrong, most homeowners would be well advised to hire a licensed plumber to complete the installation of a sewage ejector pump. Master Plumbing & Mechanical services the Washington, D.C. metropolitan area. Contact us for information on sump pump or sewage ejector installation.